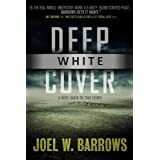 Deep White Cover is a gripping first novel by author Joel Barrows. He’s a district judge in Iowa and a former federal prosecutor, so he brings a wealth of insider information to his story of ATF undercover agent Dave Ward. Ward’s mission is to infiltrate a Texas-based white supremacy group hellbent on protecting the southern U.S. border and keeping Central and South American immigrants – legal and illegal – from flooding America and taking over the country. A subplot follows Jacob Meade, a white supremacist turned witness who is in the witness protection program. Meade’s growth from alien-hater to something more human is a nice piece of character development. The Office of the President gets woven in as well, and the climax of the book hinges on a plot to bring the president down. This is a great summer read, and it couldn’t be more timely. This entry was posted in Arts & Music, Society and tagged ATF, crime, immigration, Joel barrows, justice, law, racism, white supremacy. Bookmark the permalink.